Your body has more than 100 trillion living microorganisms, mostly in your digestive tract, with bacteria outnumbering the cells in the body, according to USProbiotics. Probiotics are beneficial bacteria that help you absorb nutrients effectively and boost your immune system. Some beneficial bacteria are present solely to keep less beneficial bacteria in check, preventing infections such as thrush, which is caused by a yeast overgrowth. Thrush, canker sores, diaper rash, jock itch, vaginal yeast infections and athlete's foot are all caused by Candida albicans -- a normally harmless bacteria that lives in your digestive tract. If Candida is allowed to flourish and overpopulate, it causes a variety of fungal infections. A Candida overgrowth is often caused by something that upsets your natural balance of good and bad bacteria. Illness, infection and taking antibiotics are common culprits. Because Candida feed on sugar, people who eat a diet high in sugar or those with diabetes and chronic high glucose levels are at risk. There are more than 500 different types of bacteria in your digestive system, which starts in your mouth with saliva. Oral thrush is so common in people with high blood sugar because saliva can contain excess glucose that the Candida thrive on. Although there are many different species of probiotics, one in particular helps fight Candida -- Lactobacillus acidophilus. Acidophilus is found in cultured dairy foods such as yogurt. PubMed Health recommends eating unsweetened yogurt to help fight thrush. You can also take acidophilus supplements. You may need to ingest up to 10 billion live acidophilus cells daily to help treat thrush, says the University of Maryland Medical Center. Probiotics don't destroy the infection; they merely help to repopulate good bacteria and balance your gut flora, which will lessen the infection. If your thrush persists, you may need an anti-fungal medication, especially if your immune system is compromised from illness or infection. Some anti-fungals can cause liver damage and may not be appropriate for everyone. 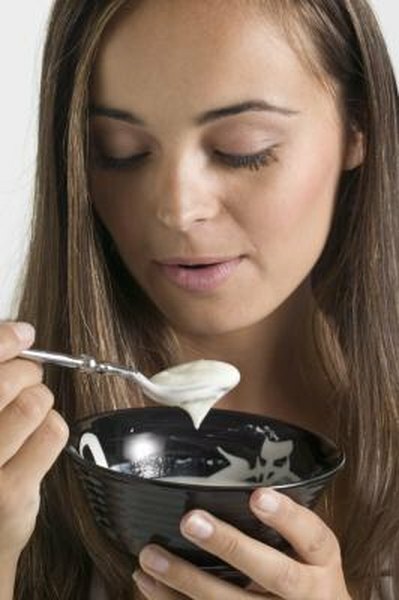 Lactobacillus acidophilus is the best probiotic for thrush and can be taken as an oral supplement or eaten in yogurt. But if your Candida overgrowth manifests as a vaginal yeast infection, you can take acidophilus topically. Vaginal suppositories that contain Lactobacillus acidophilus can be used twice daily for one week to help fight Candida. Adding more acidophilus microbes to your diet will help prevent all types of future yeast infections.